With exceptional hotel services and friendly staff, you’ll receive the quality of service you’d expect from a world-class city hotel along with the many added benefits of apartment-style accommodation. During your stay at The York, you’ll enjoy generous room space, modern facilities and the standard ‘comforts of home’ as well as daily room service and cleaning. View 360 photos of The York on Facebook. 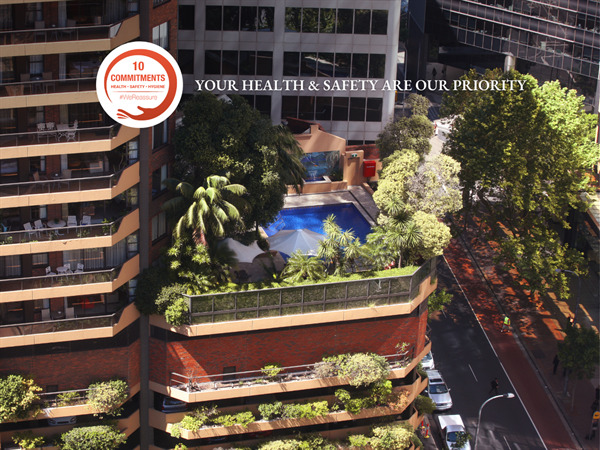 With 100 suites, The York Sydney Serviced Apartments by Swiss-Belhotel has something for everyone. Whether you’re looking for studio apartments in Sydney CDB for leisure, three-bedroom executive apartments for business or family accommodation in Sydney CBD, The York will meet your exact needs. Each serviced apartment features a fully equipped kitchen, laundry, separate bath and shower, and an open plan lounge and dining area, all complemented by spacious open-air balconies with stunning views of the Sydney cityscape. The York’s smallest apartments are double the size of a standard hotel room with many larger suites that comfortably accommodate a family of six, making them ideal for overnight or longer-term stays depending on the occasion. The York offers guests 24hr secure parking within the building, and our friendly reception staff will assist with restaurant bookings, car hire, babysitting services, tour bookings, site-seeing and local event advice. Booking direct brings lots of benefits, discounts and special offers. Whether it’s discounts on extended stays, holiday and weekend packages, early-bird booking, or a getaway for your family, The York has you covered. Browse our Sydney CBD hotel deals here. With such a central location, The York’s serviced apartments in Sydney CBD puts guests at the very heart of the action. The Art Gallery of NSW, Museum of Sydney, Queen Victoria Building and the Royal Botanic Garden are all within a ten-minute car ride. Additionally, if you’re looking for hotels near Circular Quay or hotels near Wynyard Station then look no further, The York has prime position for transport. With its superb location amongst Sydney’s renowned icons, entertainment precinct, international shopping district, corporate business and financial centre, The York Sydney by Swiss-Belhotel is the ideal apartment hotel in Sydney. Guests can enjoy an exclusive charge-back facility at Hungry Bean Café, a leisurely stroll away from The York. The café serves delicious coffee, food and snacks with breakfast and lunch served anytime, Monday to Friday between 7am and 3pm. The York by Swiss-Belhotel has 5 Levels of secure parking in the building, available at AUD $50.00 per day per car and the charge can be settled upon departure. The access to our car park is from the back of the building on Margaret Street, in between York & Clarence Street. At the top of the driveway on the right hand side there is an intercom connecting to reception. Press the button and advise reception of the booking name to gain access to the car park. Please park your vehicle in a non-reserved space to avoid a fine. Guests often comment that The York is a great place from which to explore Sydney CDB and mention how convenient the location is when travelling for business. Strong Wi-Fi, great service and all the comforts of home are also regularly mentioned in reviews. Read more here. Stay in touch with all the latest news from Swiss-Belhotel, your top international hotel group. With quality accommodation options across the globe you can rely on Swiss-Belhotel to provide you with a home away from home, wherever you may be travelling to. The York by Swiss-Belhotel is proud to offer our guests a charge back facility at Hungry Bean, across the road from the hotel, 45 Clarence Street. The York Sydney Serviced Apartments by Swiss-Belhotel offers many facilities to make your stay more enjoyable including a 24 concierge service, outdoor swimming pool and a business centre. On arrival we offer secure parking and throughout your stay you can use our complimentary WiFi internet access. The York by Swiss-Belhotel is centrally located so it is just a short walk to Sydney's major tourist attractions including the Sydney Opera House, Sydney Harbour Bridge, Circular Quay, The Rocks, and the Sydney Botanic Gardens.